Bone grafting is a procedure that is used to build bone so that dental implants can be placed. Bone grafting techniques are designed to rebuild bone structure with the minimum amount of surgery necessary and optimal patient comfort. Major bone grafting is usually performed when patients need to repair defects of the jaw. Large defects are repaired using the patient’s own bone, which is harvested from other places on the patient’s body. Common donor sites include the skull, hip, and knee. Defects that require major bone grafting include when the patient suffers a traumatic injury, tumor surgery, or congenital defects. Major bone grafting procedures are typically performed in a hospital operating room, and require a hospital stay. Minor bone grafting is usually performed when the patient does not have enough bone structure to support and stabilize an implant. Ridge Preservation, Sinus Lift Procedure and Onlay Bone Grafting are all forms of minor bone grafting surgeries. Why Don’t I Have Enough Bone? Bone grafting can increase the height or width of the jawbone and fill in voids and defects in the bone. 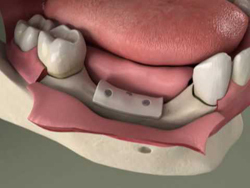 Deformities in the jawbone can be corrected, and restructuring of the bone can provide added support. Bone grafting can also be used to limit or prevent bone recession following a tooth extraction or periodontal disease. What Is Used to Build Bone? Autogenous Bone Graft – Bone taken the patient’s own body, usually from part of the lower jaw or the chin. This method is usually preferred because it produces the most predictable results. The bone grafting procedure can often take several months to complete. Bone is added to the affected site. This bone will fuse with the existing bone and the migration of cells will cause firm adhesion and cell growth. Supplementing the jaw with bone will result in greater bone mass to help support and anchor dental implants.